I’m not sure if it was simply a stroke of organisational luck or if it was completely, totally planned to be this way. All of the wedding guests arriving from Australia who had not yet made it to India were rocking up on the same day. Sure, it may well have taken us a full day to all be there, but I still think that it was a fairly impressive feat. Elena and I were the first by a good few hours, which in a way, was pretty convenient. We’d decided that after almost fifteen hours in transit it would be sweet to grab a shower. Wandering through the surprisingly bare arrivals lounge, I thought all airports had at least a McDonalds, hoping to find a bathroom that had a shower or even a hotel we could maybe check in to for a couple of hours, we found a spa. A self-described spa. I wouldn’t call it a spa. I won’t even refer to it as a spa again. We could book in for a couple of hours, use the shower, drink the bottled water, sit in the private rooms. Somehow, I managed to figure out a way that we could pay for a shower each and the privilege of sitting in a chair in full view of the massage room. A good start. The shower at least freshened us up, which was just what we needed. By the time we were cleaned up the next guests were due to arrive. Tegan and Bethany, who are not a two piece girl band but Tamsin’s childhood neighbours, arrived from Singapore on a delayed flight several hours later than us. It was going to be another several hours before anyone else was due to arrive so through friends of friends, social media and who knows what else, they’d managed to book a day tour of New Delhi, even organising for Elena and I to tag along at the last minute. There were a few scheduled stops for some tourist hot spots, photo opportunities, but mostly unscheduled stops for traffic. I don’t know why the roads in New Delhi have lines painted on them. On day one, I’m happy to claim that they quite obviously have no bearing on traffic regulations. Vehicles of all shapes and sizes weave amongst each other, angling, crossing, straddling the lanes. So far we’ve been reliably informed that head checks, mirrors, speed limits are all optional. That is assuming you even choose to acknowledge their existence at all. Even learning to drive, which seems like a pretty daunting experience, is seemingly unregulated. You may or may not put a red L somewhere on your car. Licenses are only really required if stopped by the police and you’ve not enough money in your wallet to convince them that somewhere at home perhaps, you have a valid driving license. Despite all this, we were surprised at how long it took before we witnessed a collision. The system, or lack thereof, while heavily disguised to a foreigner, works very well for the people who have learned to live with it. Driving through the city provides an opportunity to look in on the life of some of the people who live here. It’s not pretty. There’s a thick fog, at least I think it’s fog. Everything is shrouded behind a curtain of grey. People with hooded heads, hooded eyes huddle around fires burning by the side of the road. Thick black smoke rises up blending into the fog. Children play in the dirt, they walk barefoot, apart from one, who crawls. I can’t bare to think of what has happened to his feet. Tarpaulins rest against walls, on traffic islands, the central reservations, a tiny mountain range of taught plastic peaks and valleys. I realise people live here. The side of the road has become somebody’s home. Buildings rise beyond them. A mismatched, stack of blocks abandoned by a giant’s child. Wood, on stone, on corrugated iron. Faded shades of pinks, blues, yellows, all thickly coated with browns, greys and blacks. I’m amazed they’re standing. Not one of them looks finished. A buffalo lounges in the garbage that has gathered under a wall, out of the wind. Stray dogs wander between the traffic, undisturbed by the horns, the rumble of engines. It’s different, challenging. Families knock on our windows, they’re selling balloons, books, tissues. Anything that might get us to part with any money, anything at all. It’s not completely unfamiliar. My mind mixes images of the Balkans, of Serbia, Bulgaria with South East London. Shacks, roller doors, market stalls. The broken paving. It has the same bleak, desolate and yet somehow, against all odds, still thriving atmosphere of Lewisham on a Saturday morning. The air is thick with the smell of the smoke, cow dung, and plenty of other unpleasant smells that hit like a punch. The thick haze fills in any remaining space. The sky is invisible. It’s difficult to take everything in. There’s so much to see yet to much of it, you feel you wish you hadn’t seen. I’m relieved when we make our first official stop. The air is thick, the sky is dark. I don’t remember the last time I felt this cold during the day. It’s pretty miserable outside. We had arrived at the Qtub Complex which to this day I still have no idea how to pronounce. I’ll have another vowel please Carol. What can I tell you about what we could see? Truth be told not a lot. I have done zero research but we have a tour guide right? So he’ll be able to tell me about what we’ve got here. Wrong. 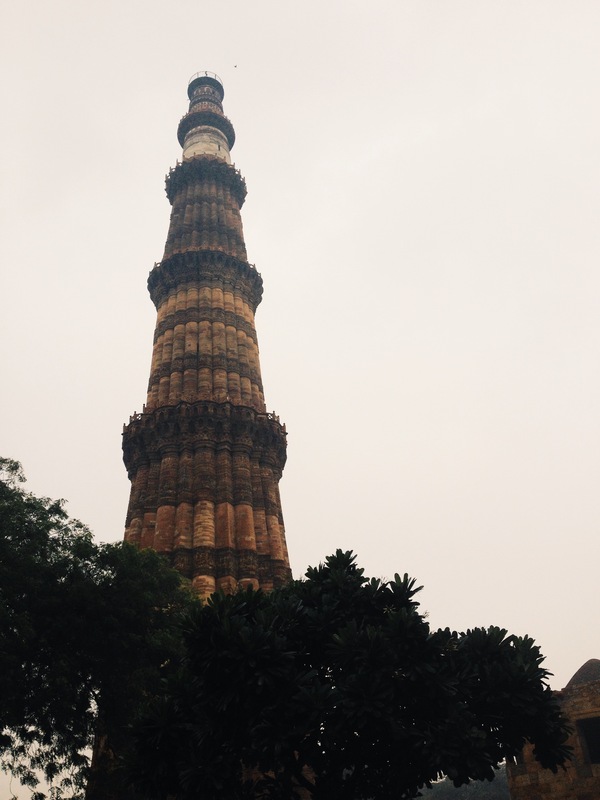 The main point of interest is the Qtub Minar which is either the oldest, the tallest, the most elaborate tower in all of India depending on who you talk to. It’s pretty spectacular, it’s curved sides carved with Persian or Arabic characters. Does it tell a story of glorious conquest? A hero’s great deads done in the name of his country? Who knows. Nobody here seems to know. The rest of the grounds are filled with ancient ruins of Seljuk mosques, tombs, arches and columns. Under the thick fog it was very oppressive. When the crows and pigeons took flight, it was almost apocalyptic. There’s a horror film waiting to emerge here. While on the grounds the first of what would be many photo opportunities presented itself. I know what you’re thinking, we don’t need you to discuss the event, just show us the picture. I don’t have the picture. A gentleman approached me and asked me for one picture please. He was with a friend. I assumed he wanted me to take a picture of him with his friend, enjoying the sights. Oh no, he wanted a picture with me. It seems that since leaving the UK my popularity has been gradually increasing and now I find myself a minor celebrity in India. What have you been saying about me? I must confess I did felt pretty awful for the guy on my way out. Just as I was leaving a tall, white skinned, ginger haired man was just entering. If only he hadn’t been so eager he could have got a photo with what I thought must have been an even rarer spectacle! Then again, maybe he did. Maybe now he’s got the whole set for his next Facebook album. We got back into the car, ready to make our way on to the next stop. I found myself thinking that after over a year of Australia’s youth it was rather refreshing to be in the presence of something almost a thousand years old. 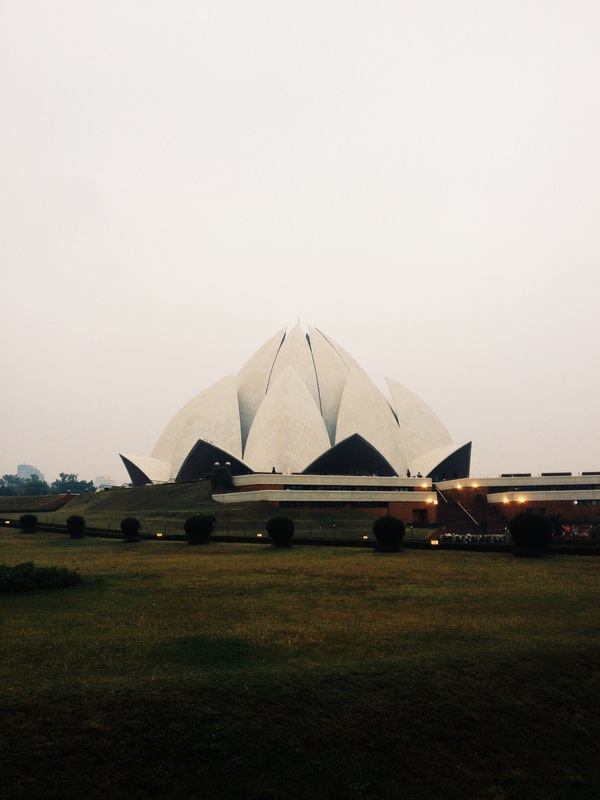 As if India knew how I felt, the next sight for us was the Lotus Temple, a place that has only existed for a few decades. Not to worry. It was looking pretty good from the walk in. It’s a temple of multi-faith worship where all are welcome to pray or meditate as they please. 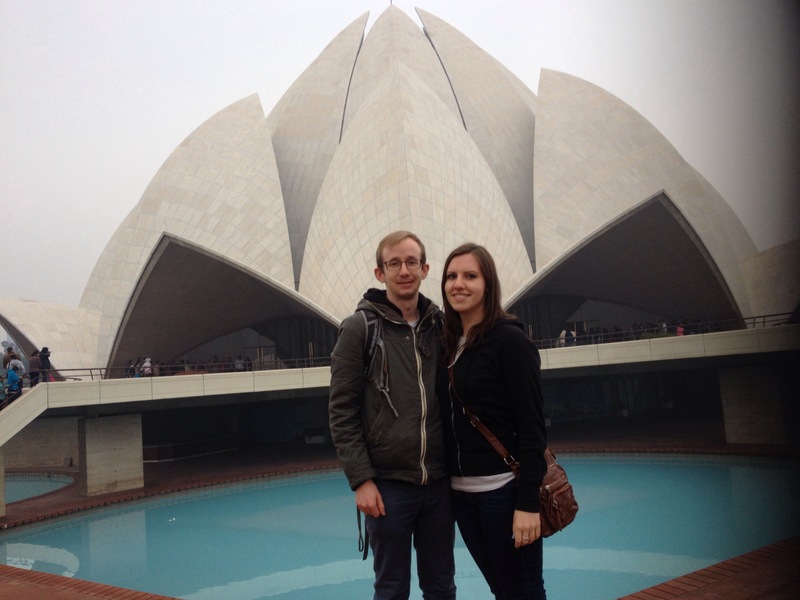 Surrounded by vast gardens that, we were reliably informed, required 3,000,000 litres of water a day we found ourselves looking at what you may well think of as New Delhi’s response to Sydney’s Opera House. As a place of worship it’s kept immaculately clean by a team of volunteers. It was not going to take us long to be made aware of some of the measures in place to keep it one of the cleanest spots in New Delhi. Bags were presented to us for our shoes. From within a certain distance you could only proceed barefoot. The ground was cold, damp, but fortunately cow-poo free. It was still a serious health and safety hazard as I found out, losing my footing simply by placing one in front of the other on the wet clay bricks. I don’t think risk assessments exist in India either. As we got closer it seemed that there were more people here who were impressed or delighted with our presence, I think Elena, Tegan, Bethany and I must have all had at least one more photo taken with a group of strangers. Elena and I started a competition, by the end of the trip, who would have the most. The temple itself was excellent. From above, it supposedly looks like a lotus flower in water. The large white petals that rise from the ground are surrounded by bright blue pools. The same thick fog made it look rather different from where we were standing. It had the appearance of something alien, a large, reptilian egg ready to hatch some Godzilla-esque beast on to the unsuspecting city. 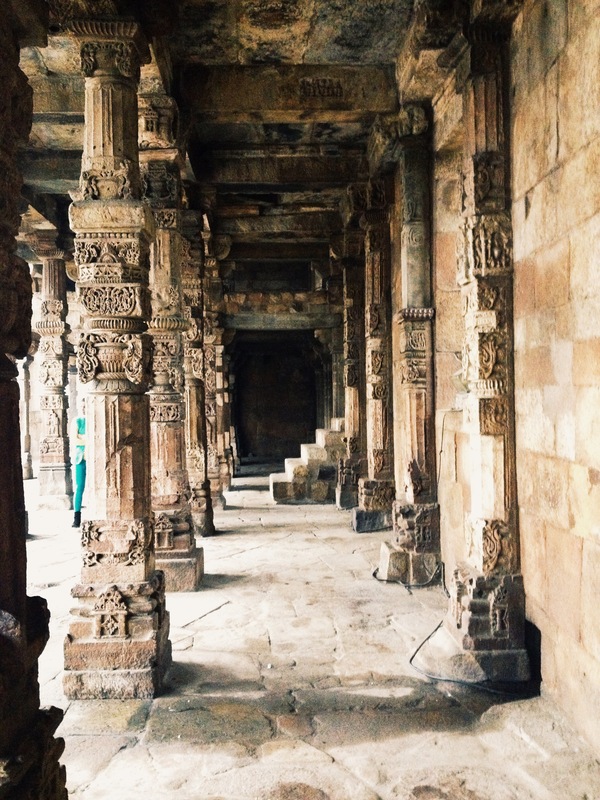 Once inside the temple the marble floors were even colder. I would be glad to have my thick socks and hiking boots back. Then we made a bigger mistake, sitting on the cold marble benches. Now our bums were cold too. Great. Just great. At least there was the atmosphere to enjoy. Silence apart from the songs of praise coming from the front. Each of us had considered whether the building was built to amplify or if a microphone was in use. We made a stop at a store on what would be a slow, delayed return to the airport to meet everyone else. There was confusion as to whether the girls would have time to buy a traditional Indian sari before the wedding, which was never really resolved. 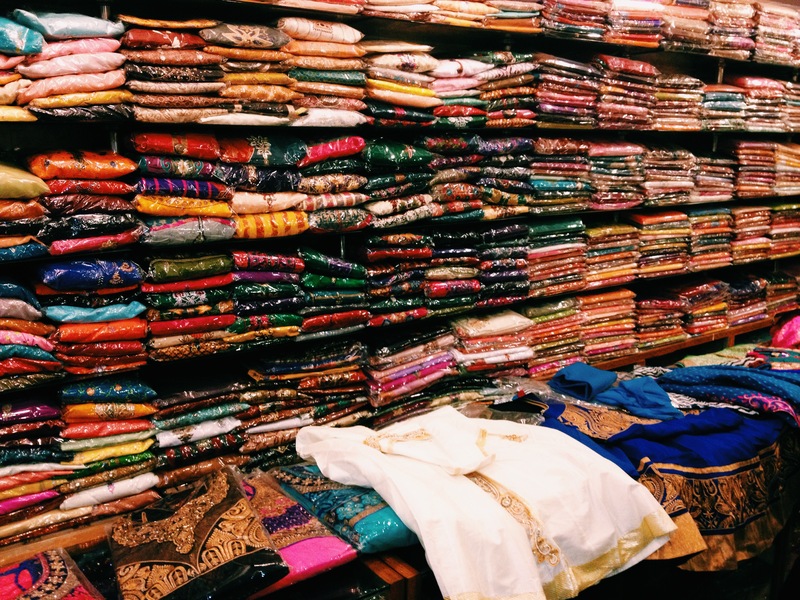 Saris are made to order and it could take a couple of days to get them measured, cut, and ready. We weren’t meant to be coming back to New Delhi until after the festivities so there was no way they would be able to get them in time. I was under the impression time had been allocated for us all to sort out wedding clothes. Bethany bought a dress just in case. We then circled the India Gate, a WWI monument to the unknown solider not dissimilar in appearance to the Arc De Triomphe as we sat in traffic that would carry us to the airport. We arrived to meet Tamsin and Jagdeep, Tamsin’s father Gary, Jagdeep’s brother and a few of his friends. An hour or two of flight delays later we had our group of Western wedding guests, joined by Megan, Sian and Jackson. It was time to head to the village. 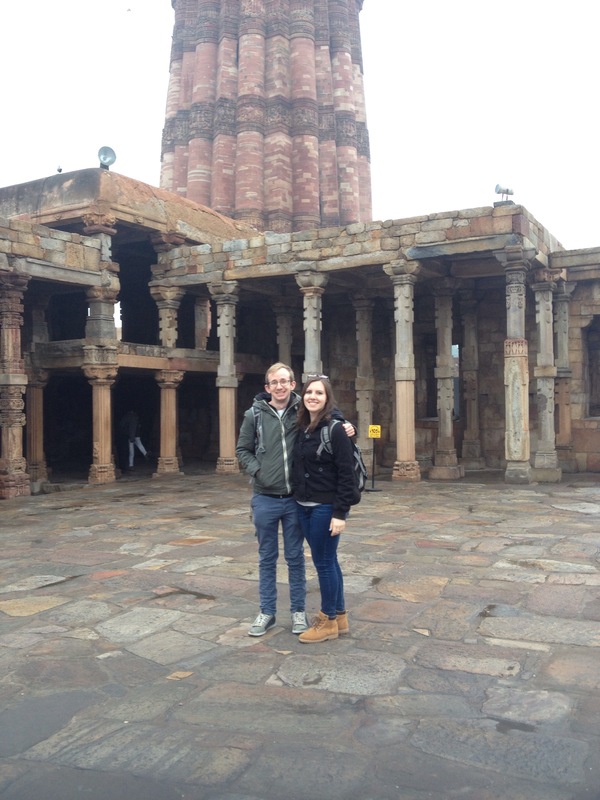 Qutub MInar is my absolute favorite…. It was a fascinating place, spooky in the fog.